In our efforts to continually improve and care for the facilities we’re privileged to operate, there will be several projects in progress during the 2019 summer season. In early September of 2018, we began a major facilities upgrade project what will result in the closure of the area through the 2019 season. 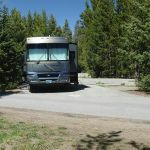 The improvements will result in redesigned sites, comfort stations and Camper Services building. Charcoal or propane grills are allowed, but no open flames (including portable fire pits). 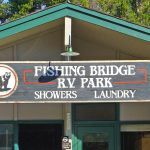 Fishing Bridge RV sites will accommodate a towing unit and a towed unit side-by-side. 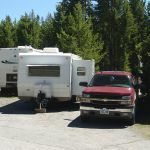 For example, a 35-foot site would accommodate an 18-foot truck and a 35-foot trailer (unhooked) side-by-side in the site. Adjust for slide outs. 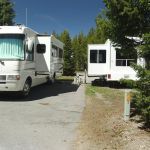 You can book tours in advance through our reservations office by calling 1-866-GEYSERLAND or at the activities desk located at the campground registration office. 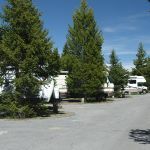 The following guided tours have a pick-up point at the RV Park Registration Office. Advance reservations are recommended. 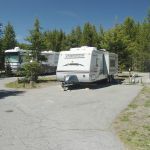 The RV Park is located near a service station (offering fuel, propane and mechanical repair services) and a general store with groceries and camping supplies. Across from the Fishing Bridge general store and gas station the National Park Service operates the historic Fishing Bridge Visitor Center and Museum. A small bookstore, exhibits and information are available here. Near the visitor center is an NPS amphitheater where Ranger programs are offered. 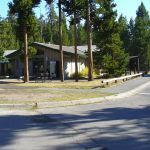 Just a few miles south is the Lake Village where the Lake Yellowstone Hotel and Lake Lodge provide a range of services including a full-service restaurant, cafeteria, gift shops, and tours. A general store, clinic and post office are also located at the Lake Village.